BOSTON – It takes a lot to grab and keep a child’s interest these days. I guess that goes for adults, too. And if you are adapting and restaging an iconic work of art, it has to be well done. 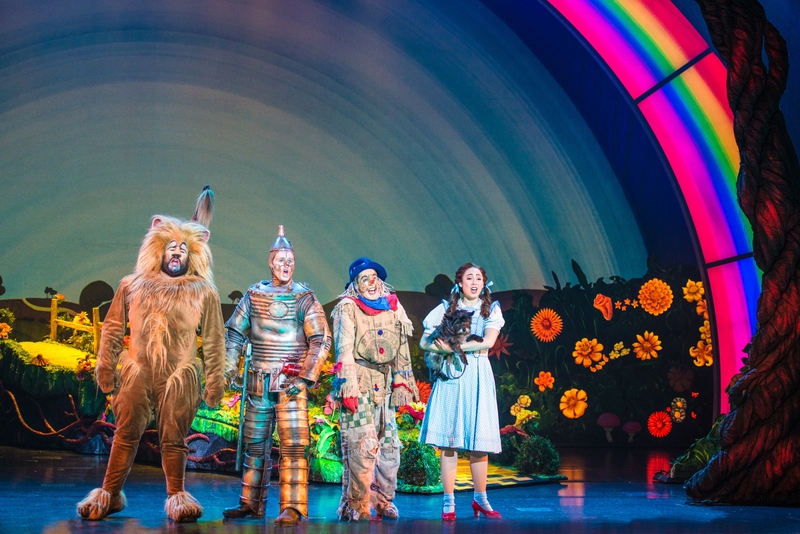 The touring production of “The Wizard of Oz” at the Citi Performing Arts Center Wang Theatre is charming, often spectacular, and a treat for the eyes and ears. It’s a fresh new look at the classic story, remounted and reimagined, taking the strengths of the motion picture – the classic tunes by Harold Arlen and Kip Harburg and the iconic characters from the classic tale by L. Frank Baum – and adding dazzling special effects and projections. The new additional songs by Tim Rice and Andrew Lloyd Webber embellish the story line and allow for a more fully realized theatrical score. This production was adapted by Webber and Jeremy Sams, who directs, from the classic movie. Sarah Lasko as Dorothy has a lovely strong, clear singing voice and a winning stage presence and her rendition of “Over The Rainbow” sets the tone for the entire cast. Morgan Reynolds as The Scarecrow is a loose-limbed, facile dancer and his rendition of “If I Only Had a Brain” was hilariously backed by some sassy crows. Jay McGill’s Tin Man is a squeaky delight. The late Margaret Hamilton long ago retired the trophy for Scariest Witch Ever – who didn’t get nightmares after their first encounter with the movie – but Shani Hadjian does an adequate cover of the roles of Miss Gulch and The Wicked Witch of the West while Rachel Womble is a good-hearted Glinda, the Good Witch. Mark A. Harmon does justice to the dual roles of Professor Marvel and The Wizard . They only appear at the beginning and the end, but Aunt Em and Uncle Henry as portrayed by Emanuelle Zeesman and Randy Charleville, were a bit staid and static and a step or two behind other company members. The cast also includes the best Toto I’ve ever seen on stage, a pup by the name of Nigel trained by the master animal trainer William Berloni. This “Oz” sounds great, from the overture to the between acts entracte to the encore, with orchestrations by David Cullen and David Andrews Rogers leading a 16-piece orchestra. The lighting by Hugh Vanstone and sound by Mick Potter are also top-notch. The producers decided against finding actors who matched the traditional physical appearance of the Munchkins, which would have added many bodies to an already large cast, but it didn’t detract from the scenes in Munchkinland. 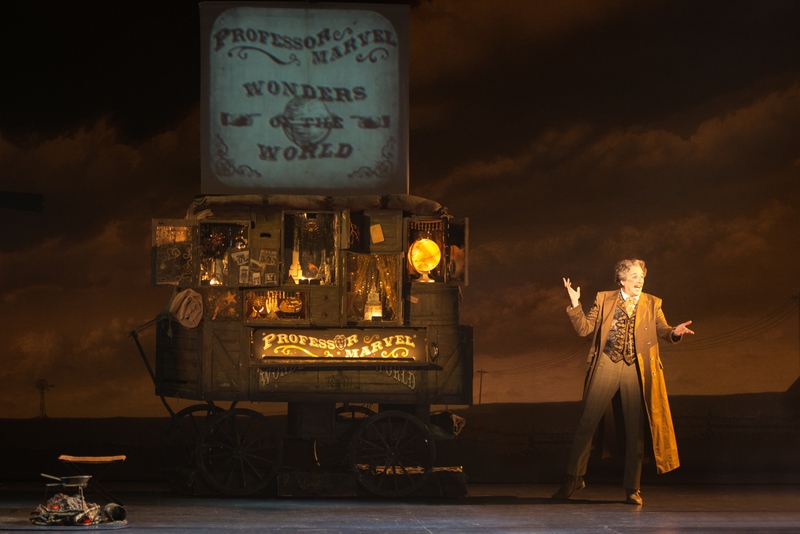 The new songs by Rice and Webber are pleasant additions, with two that stand out – “Wonders of the World,” sung by Professor Marvel to Dorothy before the storm, and “Already Home,” a ballad added as Dorothy says goodbye to Oz. If you are looking for an ideal way to introduce your child to live theater, you can’t go wrong here. This “Oz” is a fine place to visit during the upcoming school vacation. The Troika Entertainment production of “The Wizard of Oz.” Music by Harold Arlen, lyrics by E.Y. Harburg, with additional music and lyrics by Tim Rice and Andrew Lloyd Webber. Adapted by Andrew Lloyd Webber and Jeremy Sams. Directed by Jeremy Sams. Scenic and Costume design by Robert Jones. Choreography by Arlene Phillips. At the Citi Performing Arts Center Wang Theatre through April 24.